After singing the Texas State song, Bluebonnet admires the Goddess of Liberty statue on top of the state capitol dome. Filled with pride, she wishes that she could climb to the top to see the statue up close. To her amazement, someone tells Bluebonnet that he has been to the top, more than three hundred feet above the ground! A part of the Bluebonnet Series, the audiobook stories of the Bluebonnet CD are just three of this well-traveled armadillo’s adventures in Texas. Featuring colorful characters and exciting excursions, these tales include a great deal of Texas history, trivia, and fun. Mrs. Barnett and her crime-busting canine, Bo, are back for another adventure. With Christmas only a week away, the pair stops in Salado, Texas, where a sneaky thief is stealing presents straight from under the tree. Bo and Mrs. Barnett know they must act fast to catch the culprit, but there is a tricky problem: the bandit is disguised as Santa Claus. Bo, the canine hero of Bo, the Famous Retriever, is back, accompanied by his owner, Mrs. Barnett. After the excitement of their last adventure, Mrs. Barnett would like to settle in to her new life of volunteering and baking cookies (her recipes are included), but her high-spirited pet has other ideas. Soon Bo involves Mrs. Barnett and his four teenage trainers in an exciting new mystery. Bo’s undisciplined mischief has landed him and his owner, Mrs. Barnett, in the vet’s office—twice. Now in a splint and a special funnel-shaped collar, Bo is finally learning obedience. He even helps a new restaurant owner, the famous baseball player Pete Incaviglia, discover who has been breaking in and destroying the kitchen at night. Summer is ending in Texas, and Bo the Retriever’s owner, Mrs. Barnett, decides that she needs a vacation. When her friends offer her a chance to housesit their centuries-old farm in Newton, Texas, Mrs. Barnett and her niece Kendall are eager to begin their adventure. When Mrs. Barnett’s son goes to Alaska, he leaves Bo, a high-spirited Labrador puppy, in her care. Initially, Mrs. Barnett is dismayed by Bo’s antics, which include chewing shoes and stealing her neighbors’ newspapers. Gradually, her new pet encourages her to get involved with her community and meet new young friends. In time, Bo helps Mrs. Barnett overcome her “empty nest” syndrome—and they both help the police chief solve a mystery. 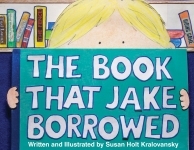 Jake and his book from the library are placed in one sticky situation after another in this cute cumulative tale, an original adaptation of the classic There Was an Old Lady. In 1945, Jella Lepman was asked by the United States Army to serve as a cultural and educational advisor for her native country. While being driven around war-ravaged Germany in a U.S. Army jeep, Jella noticed how hungry the German children were for books since their schools and libraries had been destroyed. Jella wrote letters to publishers all over the world and asked for donations. These donations became an exhibition of children’s books that traveled throughout Germany. Books continue to be donated by various countries, forever honoring the spirit of Jella Lepman and her belief that books truly can make the world a better place. 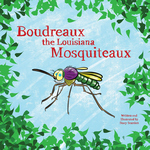 Swept away by a hurricane shortly after his birth, Boudreaux the mosquito has one biting question that needs to be answered: what are mosquitos supposed to eat? Across the swamps of Louisiana he goes, determined to find a breakfast fit for a pest. Unfortunately for Boudreaux, not a single animal is able to help: The alligator tells him to ask the wolf, who tells him to ask the bear, who tells him to ask the wild hog. Before he knows it, Boudreaux has exhausted his wings buzzing from one ear to the next, and he’s still no closer to finding his first meal! He finally receives a very intriguing answer . . . but what will become of Boudreaux when he tests this theory? 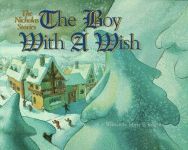 With amusing rhythm, repetition, and alliteration, author Eric Ode introduces Simon the Wise, Bogsworth the Strong, and Randolph the Brave, who venture across the kingdom determined to vanquish the dragon that has been munching on townsfolk for lunch. The most unlikely band ever to have been knighted is accompanied by the littlest of sidekicks, Small Saul, who tags along with his trusty mandolin. In this captivating and hilarious illustrated poem, young readers will learn that a world without words is confusing and downright exhausting! Meet Robbie, who would rather hide under his desk and swing from chandeliers than read. When a sorcerer removes the words from the entire world, mayhem results. Parents and grandparents know well that timeless tales generate endless questions about our holiday traditions, such as “Where did Saint Nicholas come from?” “How does he visit so many children in just one night?” “Why does he leave gifts for girls and boys?” The Nicholas Stories answer these questions about Christmas in a way that shares the true special spirit of the holiday. Hardcover. In this second book in Greg Watkins’ Big Bill and Buddies Series, the Bad Bird Bunch is stuck in a tree as a hungry alligator waits below. Brendon Mouse asks his friend Ellie Funt to help get the birds to safety. The Bad Bird Bunch are shocked when Ellie, Brendon Mouse, Bartholomew Worm, Bob Cat, DJ Dog, and Bill, the Big Beaked, Big Bellied Bird, the star of Watkins’ first book, rush to rescue them. The African-American buffalo soldiers, nicknamed by the Cheyenne Indians because of their curly hair and bravery, joined the six black regiments commissioned by an act of Congress in 1866. These men, many of whom were former slaves, enlisted in the army to earn a steady income, acquire an education, and gain respect. One sleepy morning, two hungry cowpokes decide to make a big, hot buttermilk biscuit. Cowboy Jack kneads the soft dough and adds three pats of butter and a smear of strawberry jam to give the buttermilk biscuit a face before setting the skillet on the fire to cook. When the biscuit is done cooking, out pops a buttermilk biscuit boy—and with him, a whole mess of trouble! Itty Bitty Betty, the Storytelling Honeybee, collects stories instead of nectar like the other bees. She shares her “beeziness”, taking readers on a narrated journey introducing young and old alike to the real “buzz” on honeybees.